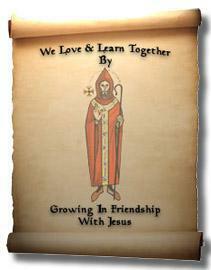 "We love and learn together by growing in friendship with Jesus." In our school family we are all valued, loved and respected and each child is nurtured through the love of Jesus to reach their full potential. With Christ at the heart of all that we do, we learn with a spirit of curiosity that leads to an understanding of God's world. We encourage everyone to be confident, happy, fulfilled and successful. Together as a whole community we recognise and value the gifts of all. We welcome everyone in a spirit of faith that reflects the teachings of Christ.